It’s our firm conviction that anyone, regardless of age, can learn to paint beautiful professional-looking paintings in almost any style—ranging from traditional to the most contemporary—in a minimum of time. Our courses consist of simultaneous instruction in drawing, composition, color, harmony & mixing, in all styles of painting, according to the interests of the student. We work individually with each student during each session, adjusting the instruction to the personal needs of the painter. “Creativision” (creativity & learning to see the way an artist does) is emphasized, to develop the potential of each student to produce fine work from the beginning of instruction. The student proceeds at his or her own pace without pressure…with the student working on subjects in which he or she is interested. There are no boring exercises in drawing. You will produce paintings right from the beginning. Painting in oils is fun as well as a growth and cultural experience. It is also the best therapy we know to cope with the pressures of daily life. Most students will begin with a landscape – and under our close supervision you’ll be able to produce a beautiful painting on your first attempt, working on your own canvas following simple, easy-to-understand instructions, step-by-step. We will actually demonstrate on small portions of your canvas to aid in your understanding as to how a painting is actually produced. We encourage students to tackle all subjects, including landscape (winter through fall), seascape (surf, boats and ships), street scenes, still life and flowers, clowns and characters – virtually anything you wish. 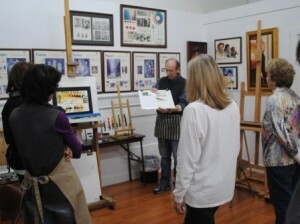 Advanced students will also study portrait, figure, modern art, realism and abstraction. This teaching method works. Give it a try. You’ve a lifetime of relaxation, pleasure and joy to gain. The learning process is fun – and artists are the nicest people. Instruction is offered for adults. Contact Kirk Miller for information. I have had the pleasure and honor to have taken classes from Kirk Miller when he was located in Tustin, CA. His pricing was fair and he was flexible with one’s schedule. He is personable and encouraging, making it easy to be his student. He is never negative or critical. He suggests tips from what he sees artistically and will walk you though whatever you might be needing as you develop your painting. 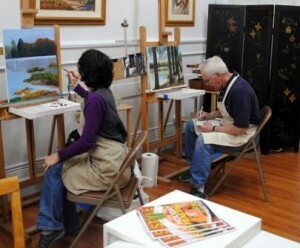 He is skilled at helping you develop YOUR painting that is attractive and captivating but is still “you”. I am certain his current students feel as fortunate to have him in Folsom as we were here in Tustin. 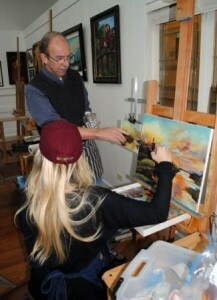 I’m taking a class with Kirk and he’s a wonderful teacher…so patient with this 1st time painter!! I took classes with Kirk too! He is fantastic! Hi Mr. Miller good to see you sharing your talents again. Wish you weren’t so far away.